The newly designed Stairmaster 4400 PT stair stepper encourages the best posture and prevents the ability to cheat by transferring weight to the arms. 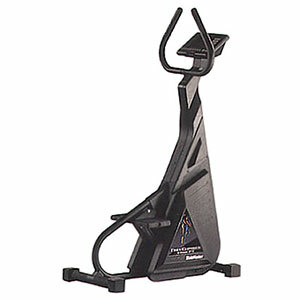 The independent step action offers the extra wide sweet spot that makes the Stairmaster stair stepper so easy to use and yet so effective. It also features an innovative quiet drive transmission to ensure smooth, responsive, and quiet operation. The StairMaster 4400 PT stair stepper also has a newly designed computer console motivates you during your workout with different program options and workout statistics. Speed control buttons allow you to increase or decrease the intensity of stepping action at any time during your workout. It also includes Polar Heart Rate monitor capability.